UPDATED: 9/10/18 - The elementary school has made the initial data updates. The updates were based on the information you provided to your child's teachers at the beginning of the year. If you have students at both RA and RMA, please stay tuned to both school's websites for current information. An official RMA Sangha launch is expected soon, but in the meantime, please contact the RMA office or your child's teacher directly via email/phone if you need assistance. We are excited to tell you that our highly anticipated new parent communication system, Sangha, is now ready for use! You will be able to receive information from Rowlett Academies K-8 AND interact with your children's teachers via the same application. Sangha is sure to streamline school-family communications because it is so interactive. It can be used for scheduling events, sign-ups, and more! We invite you to download the application via your phone's App Store (Apple and Android friendly!) Your teacher has been collecting updated emails/cell phone numbers. You will utilize your email and/or phone number to access the system. Invitations have been sent to the email/phone numbers we have on file. 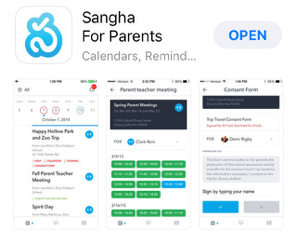 You should download SANGHA FOR PARENTS, not the Teacher/Admin application.